Q&A: Boston Marathon Legend Wayne Levy - Eat. Drink & be Skinny! I’m off! I’m on a jet plane and en route to Newark where I’m looking forward to meeting up with Sharon from Mommy Runs It then we’re off to Tel Aviv to kick off our Israel adventure to run the 2015 Jerusalem Marathon! For latest and greatest, be sure to follow me on Instagram and Twitter for quick updates. And I couldn’t possible go a full week without sharing and info here on eating, drinking and being skinny, so I’ve enlisted the support of my fav runner blogger friends! Here is the first of three you’ll see this week. This post is from Sheri Matthew’s from Sheri Life Fitness a gal I’m super-uber proud to call a dear friend and also my co-author of Gals Who Run Marathon and Half Marathon Training Guides! Here is an interview she did last year with marathon runner extraordinaire, Wayne Levy, who was also kind enough to write our forward for our guide. I was also able to meet him when we were in Boston last year, and in fact, he went out of his way to bring us throw away sweatshirts for the start line…just before he raced his heart out in a killer Boston performance. A true star. With the Boston Marathon — and anniversary of the finish-line bomb that shook the whole country at the sport’s most revered and respected marathon — drawing closer every day, I had an opportunity to get real with hard-core runner and owner of RunBoston Wayne Levy. Wayne is a Jamaican-born running legend who makes everyone feel like an old friend, and I have to admit, I was a bit starstuck by the fact that I was talking to a guy who has run over 100,000 lifetime miles including seven Boston Marathons. At 6:21 p.m. Boston time, Wayne is just about to leave his office when he fields my call from California. He is attempting to squeeze in his nightly run, already missing the daylight. As a runner, I know the importance of getting in these last training sessions with Boston approaching, but the thing is, Wayne is doing it in 16-degree weather! Forget the laundry list of running accomplishments this man has racked up over the years; this is the real difference between him and me. You couldn’t pay me to run in 16-degree cold. Heck, you couldn’t pay me to run in anything less than 40 degree. Hashtag California runner. “My meet’n went late tonight,” Wayne says. I smile in the phone. “Meet’n?” I tease. Wayne, as mentioned, originally comes from Jamaica. He moved to Connecticut when he was 12, and characteristic of his homeland, he doesn’t pronounce the “ing.” Running becomes run’n when Wayne says it. Train’n, meet’n, run’n, … but always smil’n. Wayne is without a doubt one of the sweetest men you’ll ever meet. His accent draws you in like a magic trick. Before we really get to talking, I suggest that we push our interview to the next day so he can go run, but he protests. “Of course not, you’re a busy woman,” he says. It’s never about him. Always you. So, after a longer-than-expected workday, he forgoes his run to talk to me about his life of running, the Boston Marathon, and a few other things very near and dear to his heart. WL: I began keeping a run journal in high school, just to learn from my training and compare what works to what didn’t. I realized in an interview before the 2013 BM, I was getting close to 100,000 miles. With some careful planning, I could target the finish line to be my 100,000 mile. It averages out to about 8-10 miles per day. If I didn’t finish I would fall short. I finished the race in OK time, not as fast as I hoped, 2:42:00 give or take (humble to say the least), but it was really a special moment to have my family there to celebrate. But shortly after my finish, the bomb went off, hitting us all in the heart of the sport, my home race, my home city, and all runners. ATLX: How did you first get into running? WL: Shortly after moving to Connecticut with my mom and sister, my mother passed away. In eighth grade my basketball coach noticed my ease running around the court, and how I would never get winded. He suggested I go out for track the next year in high school. I did, and my coach saw potential in distance running. When someone believes in you, you start to believe in yourself. I ran at Amherst College, where I became 10,000-meter champion. ATLX: How did you got from competitive running to tours around Boston with RunBoston? WL: You know, this city has such amazing history and running had really gotten me everything I have in life today, so when I emailed the original owners of RunBoston tours, I told them how running saved my life. I love Boston history, running, and people – what’s better!? I began guiding tours and loved it and when the couple that owned it wanted to expand their family and asked me if I would be interested in taking over, I said, ‘I would be so honored.’ We do customized run tours, any mileage or pace, historic sights (freedom trail), for individuals and groups. Many folks coming to run the marathon want to see the course. My team really enjoys meeting those who come to take the tour. ATLX: You mentioned running saved your life? WL: Yes, in high school I started hanging out with the wrong crowd. I met a group of older men in their 20s and 30s who ran for the “Runners of Abebe” (named after Abebe Bikila) and they insisted I come along. They sort of mentored me and stressed the importance of education. I am forever grateful for them keeping me running, literally on track. They’re the reason I went on to Amherst and a successful track career. ATLX: With a career, owning RunBoston and working with the Massachusetts Commission for the Blind, and a family (wife and three boys: Justin 10, Jarod 4, and Julien 2 – aka the “J” brothers), how do you have time to train at your level for the Boston Marathon? WL: As soon as I am off work, I’m on the clock to squeeze in a run and get home to see my family. When that door opens there are three boys who need their dad, dinner, bedtimes, homework, life, and I wouldn’t trade it for anything. You make time, run doubles, cold mornings, cold nights, whatever. And I feel good about what I do at the Massachusetts Commission for the blind – we improve the daily lives of the blind in any way possible. ATLX: As someone who runs this course on tours and competitively, what’s your advice? WL: Well, I didn’t even finish the race the first time I ran it. I didn’t respect the distance or the course. Lesson learned at mile 17-18, when I had gone too hard and the hills start. I suggest breaking the course up into thirds. The first is miles 1-17. If you’re feeling good there, you’re doing great. Next is miles 18-20, where a series of hills begin, and those miles will be slower. You can’t maintain your race pace to stay at or below threshold. And third, mile 21, at Heartbreak Hill, that’s where the Boston Marathon begins. 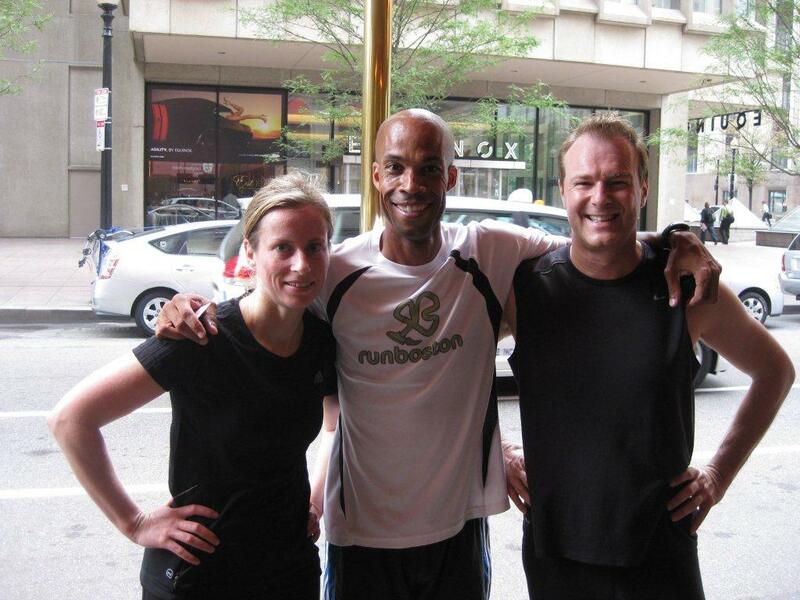 ATLX: What does it mean to you to be the only competitive runner on the Boston Athletic Association board? WL: The BAA has a membership, or a group of folks appointed by the board involved in the Marathon and run community, acting as advisories. The commission is governed by a Board of Governors, which makes all decisions regarding the Marathon. Sort of like the Supreme Court, no one new is elected to the Board unless a seat is open. This appointment is such a tremendous honor as a runner. It’s fitting that this last answer cuts a little short. Getting Wayne to talk about any of his accomplishments, let alone his pillar-like standing in the Boston running community, is nearly impossible. He’s too humble. You can feel him blushing through the phone. 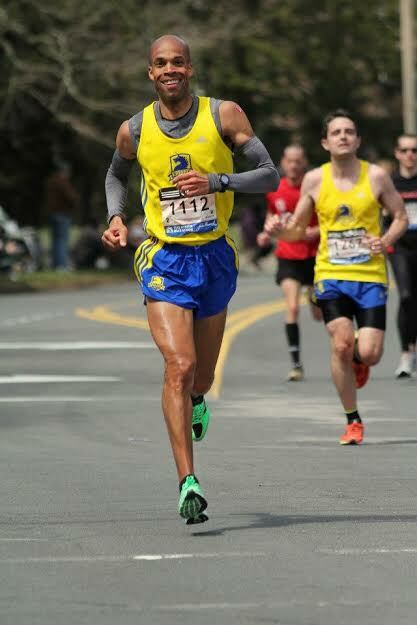 Come April 21st, he’ll be the only BAA Board member actually run’n the Boston Marathon, and he can’t wait. It’s his eighth, and it always feels like his first. I’ll be in Boston myself, and at some point I’ll certainly be looking Wayne up. Though I won’t exactly be keeping up. 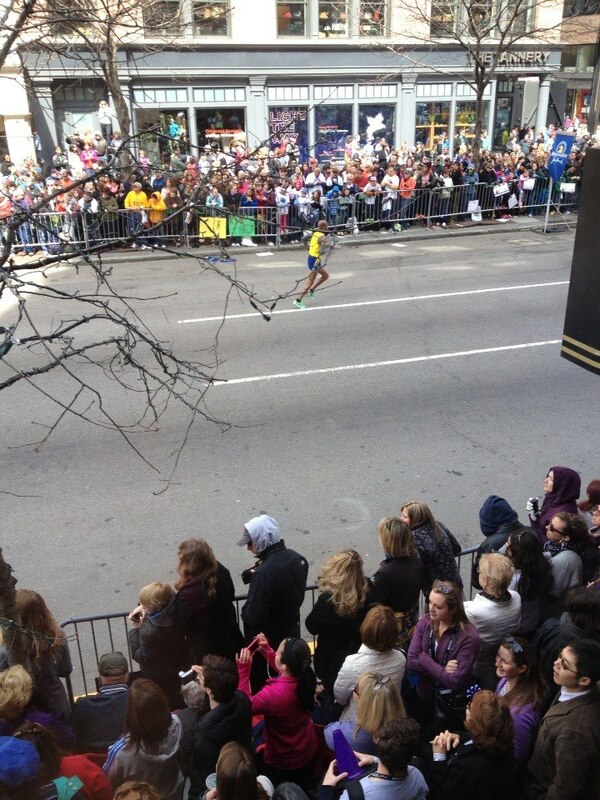 Wayne’s personal-best marathon time is a blazing 2:34:00. I had to pry that out of him.